Works in Progress are fun. It's great to see the progression as you go along-- or in my case, see how many times you've reworked the same section! Here's "Maralise Moonscythe" a Reaper miniature. She's perfect. Want to know why? I can't find a picture of her painted on the manufacturer's website = free reign! She's perfectly flawed (see "How I Approach Painting") & lost her rapier over time. She's been a staple in our 3+ year DnD tabletop campaign. 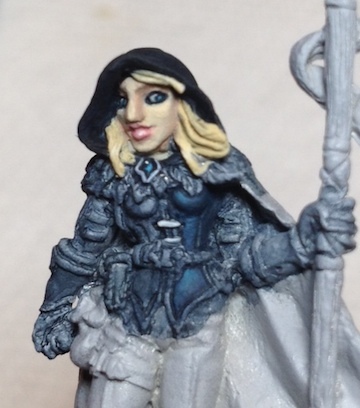 Maralise has rolled around in our bag of pre-painted minis forever and has worn many hats. She played a druid named Kallisti who gave us our first adventuring quest and has made appearances as "oh-what's-her-face" the Random Female NPC on several occasions. She's never been painted and at one point was poorly primed by yours truly. A few weeks ago, I stripped the mini of primer and started from scratch-- and scratched-up she was! I don't know what kind of brawls she got into in that bag of DnD paraphernalia but she was pockmarked and needed some celebrity-worthy spackling. Maralise went from wide-eyed beginnings (like really wide) to a little beauty I'm now quite fond of. While I'm not done painting her, I have to brag on her long-lived campaign career. She's stood the test of time, just like another celebrity you may have heard of. Total accident, I swear!